Our weekend was much less eventful than the previous few...which was a welcome change. Andrew worked the weekend which meant I was off on Friday and got to hang with P all day. Saturday morning we hung at home and then went to Ben's basketball game in the afternoon. 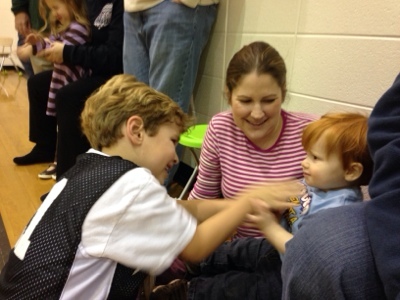 Perry loved the game and watching Ben run around the court. 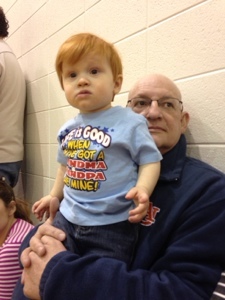 Perry's shirt says "Life is good when you've got a grandma and grandpa like mine." Guess where he got that?!? We might have been playing to our audience putting him in it that day given they were keeping him that evening for us. Saturday night Ann and Gary graciously agreed to let P come over for a sleepover so Andrew and I could have a date night. 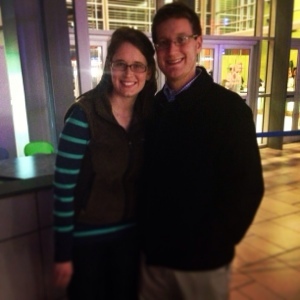 We went to Red Robin for dinner and then to see Saving Mr. Banks at the movie theatre. It was so fun. Then we got to come home and get some things done at home that are hard to do with a toddler on the move...like reorganize his toys and closet. Then we went to bed with no blinking baby monitor by our side. It was really nice. We had a talk with Perry that he needed to be a good boy and sleep good so that he would be invited back for more sleepovers...and he did. Good boy! We met up with Adrienne and Chad for dinner and the movie. The movie was awesome. It is funny that when we left Andrew's sentiment was "wow that was a little more depressing than I thought it would be" while my sentiment was "that was not near as sad as I thought it would be." Its all about expectations and how much commentary we have each heard on social media ahead of time I think. Both of us agreed that it was a really good movie though. Made me want to come home and immediately read more of the backstory of the making of Mary Poppins. We didn't see Perry again until church Sunday morning which meant we could sleep in. Well it meant that Andrew could sleep in and I could get a pre-church run in. The rest of Sunday was uneventful. Sorting about a million pounds of outgrown baby clothes, a 3.5 hour nap (for Perry) and planning for the disney half-marathon next month pretty much sums it up.